There has been a lot of debate whether electric toothbrushes are better than manual ones. But there is no debate that the Philips Sonicare DiamondClean is much better than most other toothbrushes, manual or electric. Your teeth and gums will thank you. 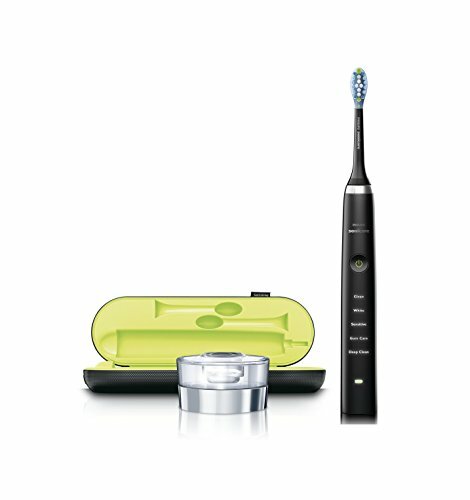 The third generation Philips Sonicare DiamondClean Electric Toothbrush is not cheap especially considering that it comes with only one brush head. But it not until you have used for a couple of weeks that you’ll understand why you paid a lot more money for it compared to other electric toothbrushes. It has been designed to deliver exceptional cleaning performance for your gums and teeth. I also love how versatile it is, with 5 mode options available. The timer, glass charger and USB cable make the toothbrush easy to use whether at home or on the road. This is one of the most versatile electric toothbrushes you can find. Without needing to change the brush head, you can rotate among five different cleaning modes. This allows you to choose the mode that is perfect for your dental needs. Clean mode – the basic everyday mode. White mode – designed to remove stains and whiten teeth. Sensitive mode – for those with sensitive gums and teeth. In this mode, the brush uses a very gentle brushing action. Gum care mode – provides gum stimulation and massage. Deep clean – this mode extends the timer to 3 minutes for a thorough clean. Philips calls it the AdaptiveClean brush head. How different is it from normal brush heads other than a fancy name? For one, it provides a more thorough cleaning compared to a manual toothbrush. The diamond-shaped bristles can get between the teeth and other hard to reach areas. Secondly, it is more effective at breaking up plaque on your teeth. In the white mode, the high-density bristles apply extra power to break up coffee, tea or tobacco stains. In just a week, you will notice a big difference in how clean your teeth feel and look. How long you clean your teeth greatly determines your dental health. Dental experts recommend that you should spend at least two minutes cleaning your teeth, 30 seconds on each quadrant. Most of us fall short of that target mostly because we are not looking at a clock and switching sides every 30 seconds. The Philips Sonicare DiamondClean aims to solve that problem. It has a built-in timer that runs for two minutes. The timer is divided into 30-second intervals, alerting you when it is time to move to the next section of your teeth. In deep clean mode, the timer runs for three minutes, allowing you to pay more attention to specific areas. The timer automatically switches off the toothbrush when two minutes (3 in deep clean mode) run out. Very easy. Thanks to the timer, achieving a thorough clean is not a problem. It will tell you when to move to the next quadrant and turn off the toothbrush when all quadrants are cleaned. The controls for turning the toothbrush on/off and changing the modes are well placed for easy use. When you are done, just place the toothbrush on the charging pod to recharge it in time for the next brushing. When fully charged the toothbrush has an exceptionally long battery life of 3 weeks. This is approximately equal to 42 brushings of 2 minutes each. The toothbrush charges through a pod that connects to your power socket. So there is no need for batteries. Instead the package comes with two travel-friendly accessories. They include a USB travel charger and a travel case. If you are going on a road trip, camping or on business travel, your dental health is sorted. With the three week battery life you may never even need to recharge the battery. But if you do, the USB charger comes in handy. Great at cleaning teeth and removing plaque. Only one brush head is included. The company recommends charging the battery for 24 hours before using it for the first time. This ensures that the battery remains in good condition for longer. When you open the package, just place it on the pod and leave it for a full day before you try it on your teeth.